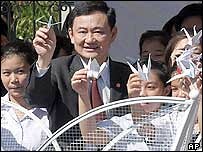 "Having failed to quell months of escalating unrest in three southern provinces by force, Thailand's unorthodox prime minister is hoping plane loads of origami peace bombs will defuse the tension. Thaksin Shinawatra has urged all 63 million Thais to make at least one paper bird in the next fortnight so they can be dropped on the three restive provinces on December 5 as a sign of goodwill to mark King Bhumibol Adulyadej's birthday..."
"Thai Prime Minister Thaksin Shinawatra, who has come under mounting criticism for his failure to stop the violence, has launched a campaign to fold 60 million paper birds to promote a message of unity. The origami birds, made by students, housewives and politicians across Thailand, are to be flown to the Muslim majority provinces on 5 December."